The Patriots have boosted safety Patrick Chung’s incentives by $800,000 for this upcoming season. Last season Chung had a down year, as his overall grade dipped to 56.5 after putting up impressive 84.4 and 84.7 graded seasons in 2014 and 2015 respectively. Chung spends most of his playing time within eight yards of the line of scrimmage, as 74.4% of his snaps came there, which was sixth most among 50 qualified safeties. Chung had 13 stops in the passing game last season, which was tied for eighth most among 74 qualified safeties. 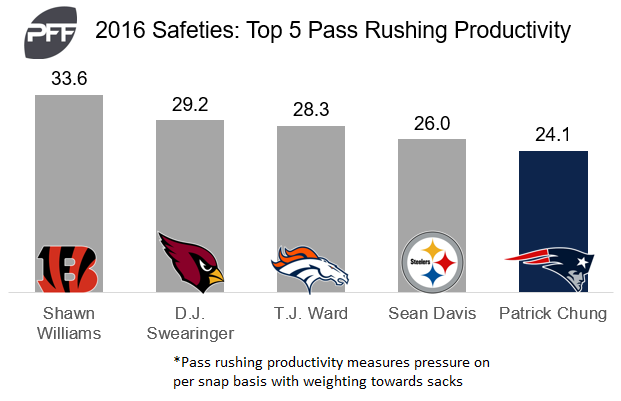 Chung’s pass rushing productivity rating (measures pressure on per snap basis with weighting towards sacks) of 24.1 was fifth among 33 qualified safeties in 2016.